Unfortunately while I was in Bishkek, Kyrgyzstan, I had a bag stolen, that contained my camera, passport, GPS, etc…so I’ve lost a lot of the photos I had. I got a new camera in Bishkek, and these are a few of the photos I’ve taken with that. Heather took a couple of photos of me, and she covered the same road I did from Osh to Bishkek. There were some fantastic views through there, with big tough passes. These other photos are from Bishkek, and my loop around Issyk-Kul. Bishkek – here’s the place I’m camping at, Nomad’s Home. I camp in the back yard next to the yurts. The Kyrgyz have their own changing of the guard ceremony, at this flagpole. That’s the National (aka Lenin) museum in the background. I feel sorry for the soldiers standing guard under the flagpole – I think they are being punished. They do the whole park/monument thing quite well, in true Soviet style. This one is the Victory Park, celebrating victory in the Great Patriotic War of 1941-1945. It wasn’t all that clear a day, but you can just make out the mountain range to the south of Bishkek. Karakol Bazaar – to be honest, I’m getting a bit sick of bazaars now. Dirty/noisy/crowded/full of the same crap. That pile of watermelons is fairly typical. A 7kg watermelon will cost around $1. I found the southern shore of Issyk-Kul much nicer, with more accessible beaches. A few beach shots, and a picture of my campsite with a nice Swiss couple (and baby), who are travelling overland in a Land Rover. They gave me some much appreciated shelter from the cold wind, and some lovely dinner. Getting up and going for a swim the next morning was…er…refreshing, shall we say. A few more shots from the road back to Bishkek. Note the cemetery – they are quite substantial structures that they build. You can just see the mounds of dirt too – I think maybe they just pile up the earth, rather than dig much of a hole. You can also see a couple of German cyclists there – I met them on the road. Kyrgyzstan seems to be full of cyclists at the moment, such a change from when I was in Europe. 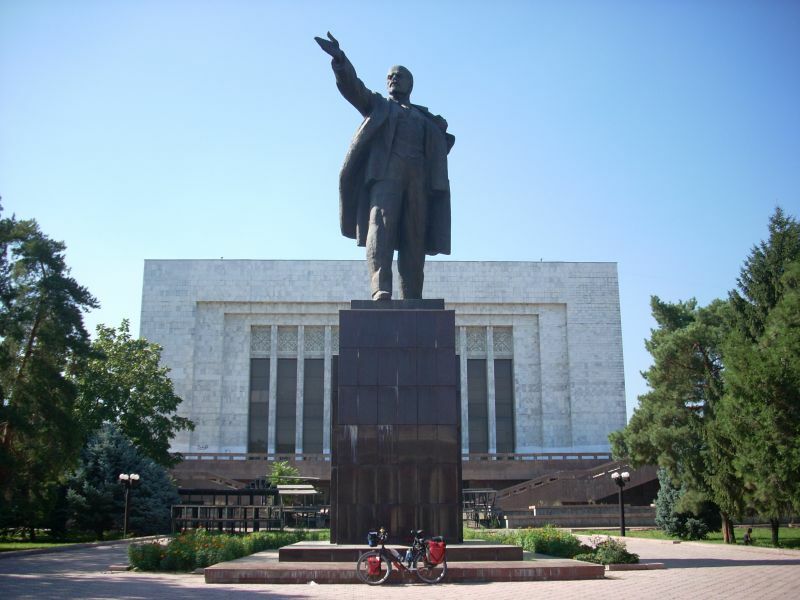 Check out this Lenin statue, with my bike looking very small at the bottom. 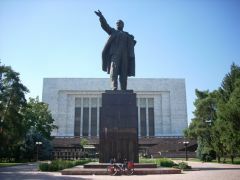 They used to have it in pride of place in a main square – so what did they do at the fall of the Soviet Union? Knock it down? Nah, just move it around the back.